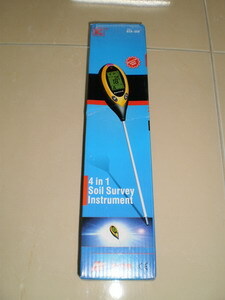 This is a brand new digital 4 in 1 soil moisture and and light tester. It is great to measure growing conditions for all kinds of plants indoors and outdoors. It can be especially useful in lawn care in determining the soil conditions in different areas of your garden and finding the correct lawn seed and fertilizer. Bad spots in the lawn can be caused by poor drainage (wet soil, test the moisture), too much or too little acidity (test the pH), or the wrong light level (test light and use appropriate seed mix (sun/shade).